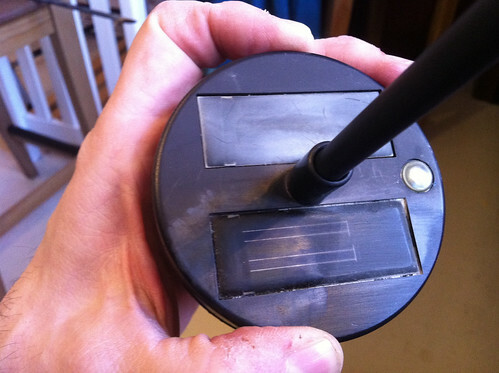 Rejuvenating solar garden lights — with nail polish! Solar LED garden lights are everywhere these days, and by ‘everywhere’ I mean ‘in our yard.’ We’ve had some for a few years now, and simply through exposure to the elements, the plastic that covers the solar cells becomes so opaque that only a small amount of light gets to them any more. With the solar cells deprived of even that meager light that we get in Massachusetts in the winter, the solar cells don’t recharge the battery, the battery doesn’t power the LED, the LED doesn’t light up, and our yard has a serious bling deficiency. 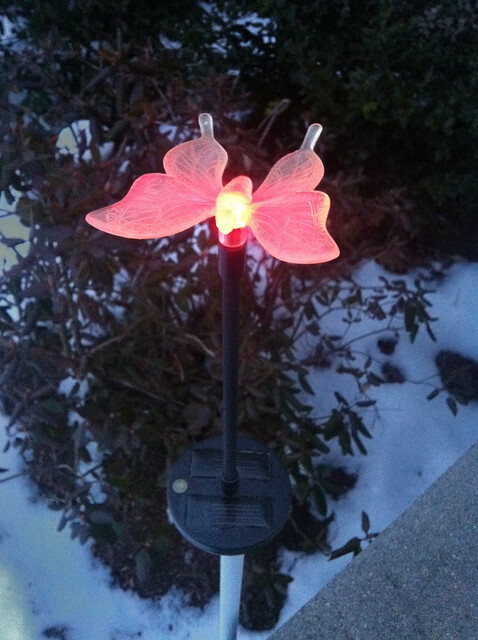 Eleanor and I took our solar garden lights inside to see if we could make them bright again somehow. My first thought when confronting the frosted-over plastic was to try to ‘polish’ it with a fine-grit sandpaper. I had 400-grit handy and tried it on one cell, the bottom one in this picture. The top shows how weathered the cells were to start. The sanding helped a little. Then I rinsed the sanded plastic dust off with water in the sink, and while it was wet it looked great, but as it dried it became frosted and opaque again. Thinking that perhaps we could use a mild plastic solvent to ‘polish’ the rough surface, I dabbed the solar cells with acetone, but again, as soon as it dried, the surface went from clear to cloudy again. “We need some way to keep it ‘looking wet’ even when it’s dry,” I mused. Eleanor got a wide-eyed LIGHTBULB! look in her eyes, and grabbed a bottle of clear nail polish! She applied a few test swatches. The nail polish made the weathered old solar cells crystal clear again! 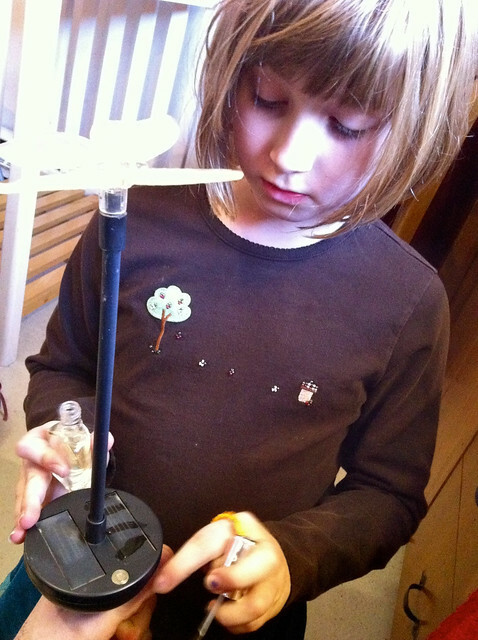 I held the lights while Eleanor applied an even coat of nail polish to all the solar cells. It really didn’t matter whether the cells had been sanded or not, so we didn’t bother. A few minutes later, the polish was dry, and we planted the lights outside again. You can see how completely clear the solar cells are. Our only concern was that the nail polish might block the UV light that provides a good portion of the solar energy to the cells. We waited for twilight to fall, and when we checked the lights: success! Even though it was mid-February the solar cells were now getting enough light to make the LEDs glow brightly! The solar cell rejuvenation project was a total success, and once we figured out how to make the cells ‘clear’ again, it was a quick and easy. So what did we learn? We learned that ‘frosted’ plastic reflects precious light away from the solar cells; clean, clear solar cells can capture much more light. 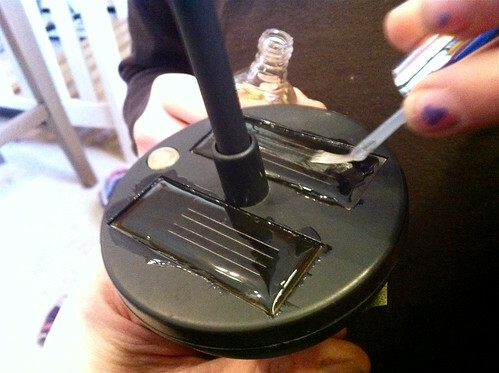 Clear nail polish is perfect for rejuvenating plastic-covered solar cells that have become weathered and dull. 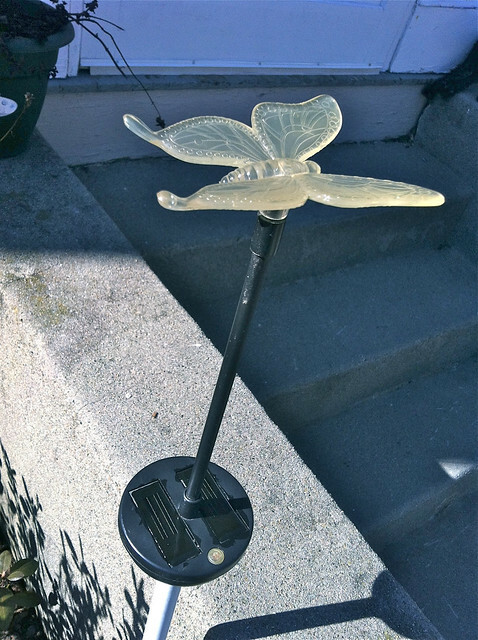 Some of the solar garden lights they sell have glass covers, and we speculated that they probably (1) are much more resistant to weathering, and (2) probably should be ‘cleaned’ differently from the plastic ones. Sometimes you need to try one thing to find out what you need to try next. Sometimes restating the problem out loud to someone else can give them new ideas. During the dim, dark Massachusetts winter, having bright, cheery little lights in the yard is great.